The Cherubic Hymn. Music by Victor. Kalinnikov (1870 � 1927). Arr. by G. Smirnov. Heal My Illnesses, O Mother Of God. Music by priest Georgy Izvekov (end of 20th � 1937). Arr. by G. Smirnov. Soloist Irina Arkhipova. Let My Prayer Arise (Let my prayer be set forth in Thy sight). Op.24, �6. Music by Pavel Chesnokov (1877 � 1944). Soloist Irina Arkhipova. Eternal Counsel. Op. 40, � 2. Music by P. Chesnokov. Soloist Irina Arkhipova. O Zealous Protectress. Music by P. Chesnokov, op.43, �6. Arr. by G. Smirnov. Soloist Irina Arkhipova. O, Mother of God. Op45, �5�. Music by P. Chesnokov. Soloist Irina Arkhipova. The Only � Begotten Son. Music by N. Cherepnin (1873 � 1945). Arr. by P. Chesnokov. It is Truly Meet. (Hymn to the Most Holy Theotokos). Music by Nikolay Cherepnin (1873 � 1945). Arr. by P. Chesnokov. Lord, now lettest Thou� (St. Simeon Prayer). Music by Grigory Davidovsky (1866 � 1952). Arr. by G. Smirnov. Soloist Irina Arkhipova. Gentle Light (The Vesper Hymn to the Son of God). Music by Iakov Chmelev (1877 � 1944). Arr. by G. Smirnov. Soloist Irina Arkhipova. The Six Psalms �2. Music by I. Chmelev. Arr. by G. Smirnov. Soloist Irina Arkhipova. Praise ye the name of the Lord. Music by Alexandr Arkhangelsky (1846 � 1924). Arr. by G. Smirnov. The Great Doxology. 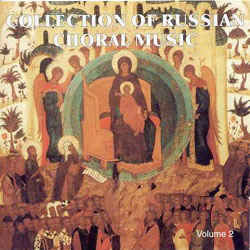 Music by Apostol Nikolaev � Strumsky. Arr. by G. Smirnov. Praise ye the name of the Lord. Music by Alexander Grechaninov (1864 � 1956). Arr. by P. Chesnokov.